Wii U Basic Pack: Depending on the size of the game, an additional storage device may be required for download. Our biggest games are always available at your local store in the traditional packaged manner. 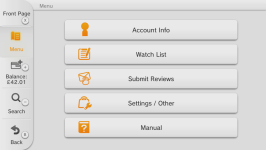 It is possible to purchase download versions of games from Nintendo eShop on the official Nintendo website. You'll recognise if a game is available for purchase if a price and corresponding button appear on the related gamepage. To be able to purchase download games from Nintendo eShop on the official website, you'll need to have a Nintendo Account which is linked to a Nintendo Network ID, and you'll need to have visited Nintendo eShop on the device you wish to download on at least once. To find out more, visit our Support section. Users will be able to enjoy the same game content as found in the packaged game by downloading it from Nintendo eShop. The downloaded game will be saved to your Wii U console's internal flash memory or USB storage device (sold separately) so if you download multiple games, you can play them at any time without needing to change Wii U discs. Your Wii U console must be connected to the Internet to download games. The downloaded game can only be played on the console it is downloaded to. Due to the large data size of these games, it may take some time for the game to download. Please be aware that the game won't download if there isn't enough available space in your Wii U internal flash memory. Why get a download version? The game content is the same as the packaged version, but you can download the title right away on release day! You can store multiple games on your Wii U console, meaning you can switch between games without having to change Wii U discs. You can purchase the download version of the game directly from Nintendo eShop. Here's our handy guide to buying games from Nintendo eShop. 1) Find the software you want by using the search function or simply browsing the shop. When you find a title you like, just select "Purchase" and proceed using the on-screen prompts. 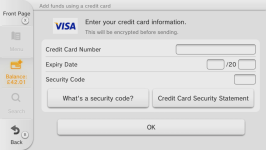 2) If you don’t already have funds, you can "Add Funds" at this stage or choose to "Pay Remainder by Credit Card". 3) You can add funds in two ways: either with a Nintendo eShop Card (which are available from selected retailers) or with a credit card. 4) If you have a Nintendo eShop Card, first read all of the information and then enter the 16-digit activation number found on the back of the card by scratching off the silver panel. 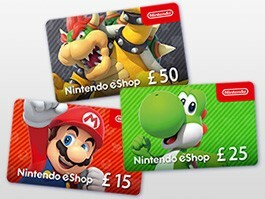 Nintendo eShop Cards are available from selected retailers in denominations of £15, £25 and £50. Please click here to see a list of retailers selling Nintendo eShop Cards (PDF, 272 kB). 5) If you choose to pay by credit card, you can use either MasterCard or VISA to add funds. First, select an amount to add and then follow the instructions. Afterwards you’ll get a receipt of your purchase. 6) Now, you’re ready to download! Follow the on-screen instructions to download your software. You can check the progress at any time by pressing the HOME Button and then tapping "Download Management". By logging in to a special website with your Nintendo Network ID, your software will start downloading to your Wii U console automatically, so it’ll be ready and waiting the next time you pick up the Wii U GamePad. Purchase a Download Code and enter it in Nintendo eShop to download software or Add-on Content for a title. Download Codes can be purchased at selected retailers and used in Nintendo eShop. On the main menu of Nintendo eShop on Wii U, tap the "Enter Download Code" button. On the next screen, enter your Download Code, then follow the on-screen instructions to download your software.